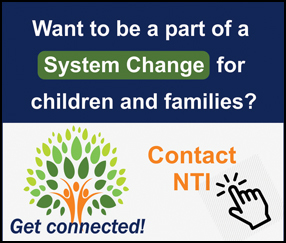 NTI enables you to better address the mental health & developmental needs of children in foster, adoptive or guardianship families. NTI is the most concise training I have seen for Child Welfare staff ever! It gets to the heart of the work, and really gives hands on tools for staff to use in supporting children and families. I keep sharing information with the rest of the child welfare executive team, regarding the training, and am excited for our entire system to get this information as soon as possible. 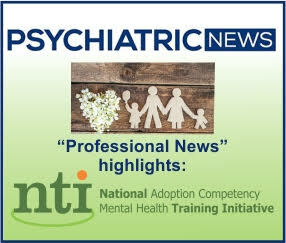 For a variety of reasons, mental health professionals typically do not receive the training required to fill adoption-related counseling needs and, too often, either do not fully understand why such training is necessary or mistakenly believe the knowledge they already have is sufficient. Adoption competence has been a rare-find among providers. 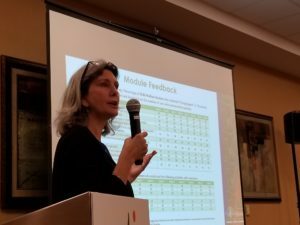 Wide use of this mental health curriculum will touch thousands of lives and help reduce unnecessary emotional pain that can grow and fester when the underlying issues are missed or ignored. The videos in the NTI training were my favorite part and allowed me to see how important all aspects of permanency are for the kids involved. The training allowed me to see that permanency doesn’t just stop at adoption or stepping down, but that it is a continuum of services that these kids need to succeed. Learning the mental health needs of children in foster, adoptive, and guardianship families makes a significant difference! Learn how NTI improves the outcomes for children and families experiencing adoption or guardianship. View our upcoming national conferences and events. Find out where NTI is presenting next! 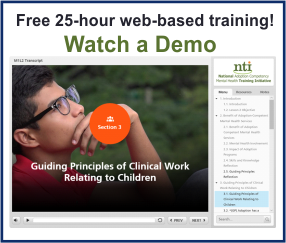 Explore NTI’s Child Welfare and Mental Health curricula. Start from the snapshot view, then dig deeper! Funded through the Department of Health and Human Services, Administration for Children and Families, Children’s Bureau, Grant #90CO1121.